Somewhere hiding around my house is a purple cockroach. You think I am kidding, don't you? I so wish I was. This is one of those stories that I was told, by the perpetrator, would be funny ten years from now, but there was some question earlier that she would live long enough to see that day. Yes, the perpetrator was my very own Princess. My story begins with me preparing for bedtime in my bathroom and hearing a scrubbing noise on the wall adjacent to my daughter's bathroom. I walked around to knock on her bathroom door to ask what she was doing: "Cleaning." Now I knew something was up because I have to go from reminding to begging to threatening her liberty for 20 years before she will clean her bathroom, and it is never done at night. However, I was having some back pain, so not too in the mood to investigate, and I remembered that she had not done it on Saturday as she is supposed to do. Yeah, I tend to be hopelessly idealistic at times, especially when I am not up to dealing with reality. Back in my bathroom resuming the nightly routine, I again hear the scrubbing, only worse. I walk back around and again knock. "What are you doing? It sounds like you are trying to scratch through the wall?" "Uh-huh. Open the door now!" On the wall behind the door is a purple spot about two inches in diameter. I am immediately upset. Now, to understand what is going on in my mind, you have to remember that because we had the windows replaced last summer that every single room in my house with an exterior wall needed to be touched up at the very least to the entire room painted and I have only one room done and another partially done, because life threw us some curves so progress has been slow. Besides the hallway, my daughter's bathroom—the guest bathroom, actually—is the only room (quite literally, the ONLY room) in my house that does not have a window (other than one of the basement rooms, which has the wallpaper peeling off and needs painted as well). Also, there is a sentimental value to my guest bathroom. Before the Princess was born, my mother came for a visit and this was the room I finished especially for that occasion with a hand stenciled border of magnolias that I liked but also knew that my mother would like. Although my mother acted like it was nothing to her when she saw it (and that was typical of our relationship), I still remember the efforts I made fondly. All this went through my mind in just a quick moment.... Then came the next moment. Why was there a purple spot on the wall? I turned to look around and found all the cans of colored hair spray we gave our daughter for Christmas. My daughter quickly explained that she was going to tell me once she cleaned it up. Okay, but.... Why was there a purple spot on the wall? Apparently, she saw a cockroach too high for her to kill herself, so instead of calling her father, who was actually home that night, or me, she decided to kill it with hairspray—colored hair spray. She said it was kind of a joke and that hair spray would come off with water...but then it did not. I just looked at her thinking how, in just a little more than a month, this girl will be fifteen years old...not under ten, when I would have expected this kind of naivety, but fifteen? Of course, I am beyond talking to her at this stage, because I am livid; I am yelling at her that the color of the hair spray is made to wash out when it is on hair as it is meant to be used and about how it must have escaped her when she took science classes that putting one chemical formula onto another can have unexpected results like adhesion or bleed through as dyes can do, all while grabbing cleaning supplies hoping that I will find something that will not damage the paint, yet remove the purple spot. Yes, I did say all that in just one breath...and more too! My husband had come up from his desk in the basement to see what I was raging about and used the calm approach to talk to the perpetrator while I finally made some progress with the purple spot. She came to apologize, a genuine apology. I looked at her sweet face with her heartbreaking, pleading eyes and said that I was very appreciative that she want to do the right thing, but I was far too angry to receive it at the moment. That is when my husband tried that same calm and gentle approach on me...and you would think the man should know better after the first two decades that we have been married. "Have you never done something that you tried to hide and fix it before your parents found out?" I honestly was too angry to think of anything right then because I was not living with my parents most of my teenage years, but I do know this one thing: I never graffitied walls! Later, after the purple spot was eliminated and the paint on the wall did not seemed to be damaged by the third chemical formula I had to use to remove it, I accepted the Princess' apology...and I allowed her to retrieve all cans of the colored hair spray that I had thrown into the trash as I complained loudly to my husband that she never allows me to use them in her hair after begging for them, yet she will use them on things she should not, like to graffiti a wall! The perpetrator has been pardoned and I am laughing about this now nine years, eleven months, and thirty days earlier than predicted. In a much calmer state, I began to think over the scene. The Princess did not just grab the first color but specifically looked for the purple one. A day or two before she wanted me to give her an idea or even just a word to challenge her in starting a new fictional story and I came up with something I thought would be fun and challenging off the top of my head: purple kitty. I really have to be more careful of my suggestions with a child having such a creative mind, but who would have ever thought...well, other than her, that is? Where was the purple cockroach? She said it escaped down the vent. 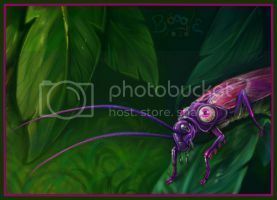 My Lord, may the purple cockroach rest in peace...if not yet, then very soon.